Thomas HOLBROOK (c. 1594 – 1677) was Alex’s 10th great grandfather, one of 2,048 in this generation of the Miner line. Thomas Holbrook was born near 1594 according to his own depositions. His age given in the sailing list of Hull’s company as 34 at time of sailing for New England 20 Mar 1634/5 is evidently incorrect. Thomas Holbrook was then a resident of Broadway, of which there are three places so named in Somersetshire. His parents were William HOLBROOK and Edith [__?__]. 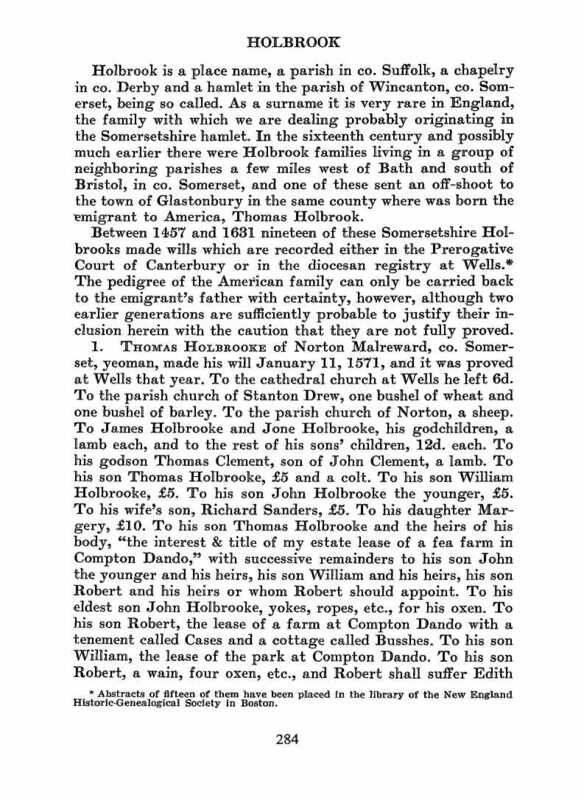 [See The Ancestry of Joseph Neal – Holbrook pages 1 -3 below for details of the Holbrook ancestry in England] He married Jane POWYES 12 Sep 1616 in St. John’s Glastonbury, Somerset England. He emigrated on the an Unnamed Ship 20 Mar 1635/36 , with the Hull Company and is recorded as a husbandman aged 34, from Broadway, Co Somerset. He brought with him his wife, Jane, and four children, and settled in Weymouth Mass. Thomas will was proved 24 Apr 1677. Jane Powyes was born about 1600 in England. She was aged 34 in 1634/5 according to the sailing list in the Public Record Office in London. Her parents were William POWYES (ca. 1568 – ) and Elizabeth [__?__]. The surname of Powys is probably derived from the town of Powys. Jane died 24 Apr 1677 in Weymouth, Mass. 1. Capt. John Holbrook 21 Mar 1617bapt. In 1635 there came a large addition to the population of Weymouth. This was the Hull Company, already mentioned and a statement made where their names can be found, but it seems best that the list should be given. They came from Weymouth in England, but some of them were from other towns in Dorset and in counties near by. We now find that the influence of Boston is felt as the center of the Bay State Colony, for permission had to be given to Hull and his company to settle in Wessagusset. Thus on July 8, 1635, the General Court of Boston passed an order giving permission to the Rev. Joseph Hull, with twenty-one families numbering about one hundred persons, to settle at Wessagusset. My DEAR MR. APPLETON: – Amongst a bundle of miscellaneous manuscripts just turned up in the Public Record Officer I find with other documents relating to New England, the following list of passengers which I have the pleasure of sending to you for publication in the Register. Mr. Appleton gave the list to the Register and it was published in the New England Historical and Genealogical Register, Vol. XXV, pages 13, 14 and 15, January, 1871. 70. Anne Holbrook, his daughter, 5 years. Thomas Holbrook was an early and respected resident of Weymouth. He and his family arrived there in 1635, and he was a Selectman there in 1641, ’45, ’46, ’52, and ’54. He became a freeman in May, 1645. Thomas was one of the grantees of the town of Rehoboth in 1643 but forfeited his share in 1645 because he did not settle there. In 1649 he was appointed a member of a commission to lay out a highway from Weymouth to Dorchester. Ten acres were granted to him in the First Division and thirty acres in the Second Division, Dec. 14, 1663. Thomas Holbrook, aged 77 years or thereabouts, deposed that he came to New England with Mr. Hull’s company in 1635, and that they came ashore at Dorchester June 7, 1635; that they went to Dorchester and the Company went to a place now called Weymouth; and that after remaining at Dorchester about a fortnight, he went with his family to the now Weymouth and built a house there (sworn to in court Nov. 2, 1666). A subsequently discovered record verifies this information. The record is a passenger list dated “Waymouth ye 20th of 1635” and refers to Weymouth, England. Among the 106 passengers are Thomas Holbrook, 34, of Broadway, Jane Holbrook, 34, his wife, and children John, 11, Thomas, 10, Anne, 5, and Elizabeth, 1. These two documents certainly refer to the same man, yet there is an age discrepancy between them. By one account, Thomas would have been born about 1589, while the other puts his birth around 1600. While both could be inaccurate, the passenger list is more likely incorrect in regard to the ages. The son John Holbrook, listed as 11 years old in 1635, was made a freeman in 1640, and the minimum age for freemanship was 21. John’s gravestone provides the best proof of the age error, giving his death date and age – Nov. 23, 1699, age 82. This information is also important, as we’ll see, in locating the Holbrook’s in England. The search for Thomas’ place of origin has been helped with the passenger list reference to Broadway, which is in Somersetshire. Nearby Broadway is the town of Glastonbury, where a Thomas Holbrook married on Sept. 12, 1616 to Jane Powys according to the records of the Church of St. John the Baptist. The baptism of the couple’s son John is also recorded in the same church on April 6, 1618. 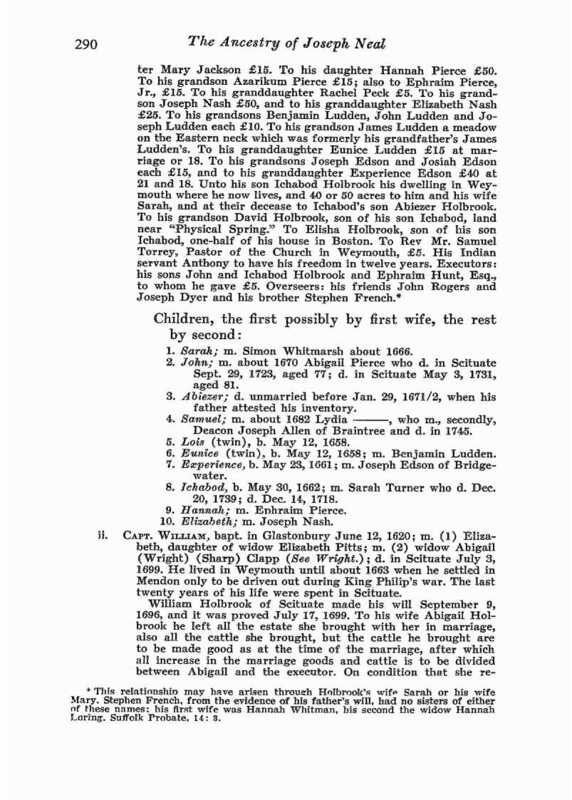 The names and date of John’s baptism match up quite well with the data on the Weymouth, MA family, and it can be stated with a high degree of certainty that this is the family of our ancestor. The surname of Powys is probably derived from the town of Powys. [NEHGR 70:258] Walter Hatch, b prob c1623; d 24 May 1699m 1) at Scituate, 6 May 1650, Elizabeth Holbrook, b c1634 in England, d after 1699, dau of Thomas and Jane of Weymouth Mass.l. Thomas Drake served in the military and was a trooper in King Phillip’s War in Jun 1676 in Punkapouge, MA. Made Freeman 13 May 1640. Deputy from Weymouth 1651, 64, 69, 71, 72, 73. Captain in King Phillips War 1676. Resided in Old Spain neighborhood, Weymouth, Ma. He was a man of some property and wealth as evidenced from his will. When he was 17 years old, Captain John Holbrook, the ancestor of Presidents James Abram Garfield and George Herbert Walker Bush emigrated with Thomas Holbrooke of Weymouth on 20 March 1635 at Weymouth, England; Left England aboard the “Marygold” with wife and family, as part of Reverand Hull’s Company. Other sources have John age 17 immigrating on the ship Alliance or Assurance. Captain John Holbrook accompanied the immigration of Thomas Holbrooke of Weymouth on 7 June 1635 to Dorchester, Massachusetts Bay Colony. John’s wife first wife Sarah French was born about 1620. Sarah died 14 Jan 1643/44. John’s second wife Elizabeth Stream was born in 1624. Her parents were John Stream and Elizabeth [__?__]. Elizabeth died 25 Jun 1688 in Weymouth, Mass. Elizabeth Stream Holbrook – North Weymouth Cemetery Weymouth Norfolk County Mass. John’s third wife Mary White who survived him and who had a “daughter Loring” mentioned in his will, but whether Loring was her maiden or married name is uncertain. He took the Freeman’s oath in 1640. He was appeared (#50) on a list of early settlers or proprietors between 1643 and 1644 at Rehoboth, Massachusetts. Hw served as selectman of Weymouth in 1648 and 1656 and was the town’s deputy to the General Court in 1651, 1664, 1669, 1671-1673. His home was in that part of Weymouth known as Old Spain. He was one of three townsman who signed a supplemental agreement regarding the deed of Natahant on 3 March 1652 at “3 1 1652”, Weymouth, Massachusetts. He served in King Philip’s War in 1675. He was the captain of the local military company for many years and during King Philip’s war, in the spring of 1676 he was appointed to command one of the companies raised “to suppress the Insolence” of the Indians and to “range the woods towards Hassanamesit.” On June 22, 1676, he was at Concord with thirty men from ‘Norfolk, a county which consisted of the settlements on the Merrimack and Piscataqua rivers, and as commander he drew the pay for twentyfour men in June, August and September, 1675, and also drew sixteen pounds fpr his own services. Defects from Boston for non-appearance Jn Pemberton, Jn Porter & Richard Knight. From Dorchester non-appearance, Consider Atherton, Henry Wedarton [Withington], Ebezar Clape. From Waymouth, Zachary Gorney. From Hingham, Jn Feres & Arthur Sherman. William Field Thomas Betell John Holbrooke, Capt. He was granted administration of his parent’s estate on the death of his mother on 24 April 1677.10 He was testified regarding his earlier presence at the Natahant deed signing, at this time about age 66, on 9 July 1685 at Boston, Massachusetts. He left a will on 12 July 1699. He died on 23 Nov 1699 at Weymouth, Mass. His gravestone indicated he was 82 years old. Obituary: “Being weak of body”; he made his will 12 July, 1699, as follows: To his wife Mary Holbrook £50, and £10, provided she give thereof £5 to her daughter Loring. To son John Holbrook his housing and lands in Scituate, and the use of one-half to his now wife Abigail after his decease; the other half to his grandson John, son of his said son John Holbrook. 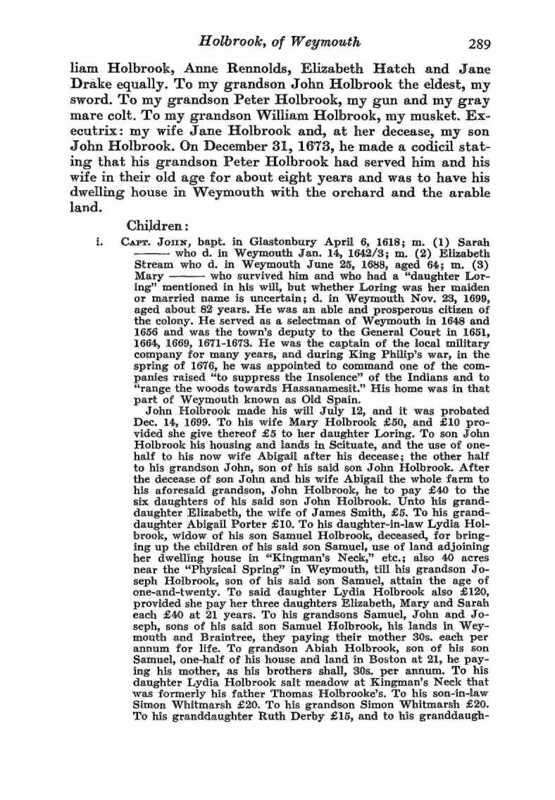 After the decease of son John and his wife Abigail the whole farm to his aforesaid grandson, John Holbrook, he to pay £40 to the six daughters of his said son John Holbrook. Unto his granddaughter Elizabeth, the wife of James Smith, £5. To his granddaughter Abigail Porter £10. To his daughter-in-law Lydia Holbrook, widow of his son Samuel Holbrook, deceased, for bringing up the children of his said son Samuel, use of land adjoining her dwelling house in “Kingman’s Neck,” etc. ; also 40 acres near the “Physical Spring”in Weymouth, till his grandson Joseph Holbrook, son of his said son Samuel, attain the age of one-and-twenty. To said daughter Lydia Holbrook also £120, provided she pay her three daughters Elizabeth, Mary and Sarah each £40 at 21 years. To his grandsons Samuel, John and Joseph, sons of his said son Samuel Holbrook, his landsin Weymouth and Braintree, they paying their mother 30s. each per annum. for life. To grandson Abiah Holbrook, son of his son Samuel, one-half of his house and land in Boston at 21, he paying his mother, as his brother shall, 30s. per annum. To his daughter Lydia Holbrook salt meadow at Kingman’s Neck that was formerly his father Thomas Holbrooke’s. To his son-in-law Simon Whitmarsh £20. To his grandson Simon Whitmarsh £20. To his granddaughter Ruth Derby £15, and to his granddaughter Mary Jackson £15. To his daughter Hannah Pierce £50. To his grand son Azarikurn Pierce £15; also to Ephraim Pierce, Jr., £15. To his granddaughter Rachel Peck £5. To his grandson Joseph Nash £50, and to his granddaughter Elizabeth Nash £25. To his grandsons Benjamin Ludden, John Ludden and Joseph Ludden each £10. To his grandson James Ludden a meadow on the Eastern neck which was formerly his grandfather’s James Ludden’s. To his granddaughter Eunice Ludden £15 at marriage or 18. To his grandsons Joseph Edson and Josiah Edson each £15, and to his granddaughter Experience Edson £40 at 21 and 18. Unto his son Ichabod Holbrook his dwelling inWeymouth where he now lives, and 40 or 50 acres to him and his wife Sarah, and at their decease to Ichabod’s son Abiezer Holbrook. 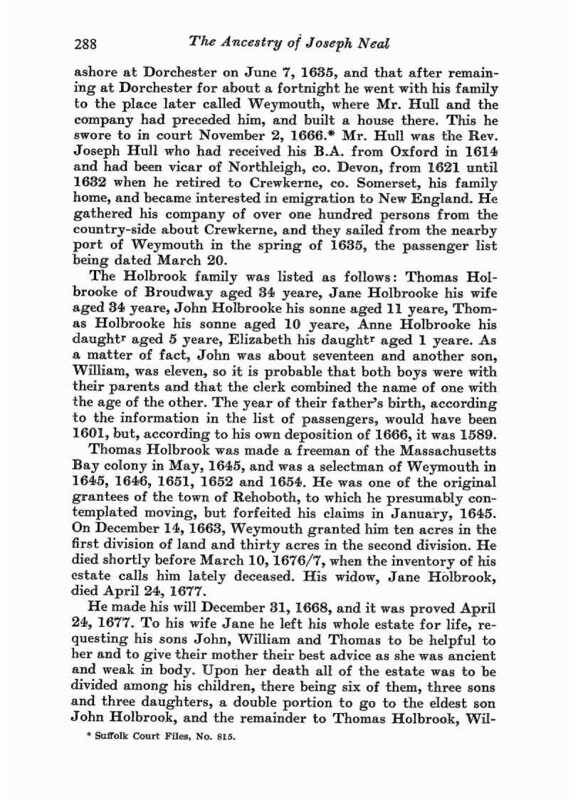 To his grandson David Holbrook, son of his son Ichabod, and near “Physical Spring.” To Elisha Holbrook, son of his son Ichabod, one-half of his house in Boston. To Rev. Mr. Samuel Torrey, Pastor of the Church in Weymouth, £5. His Indian servant Anthony to have his freedom in twelve years. 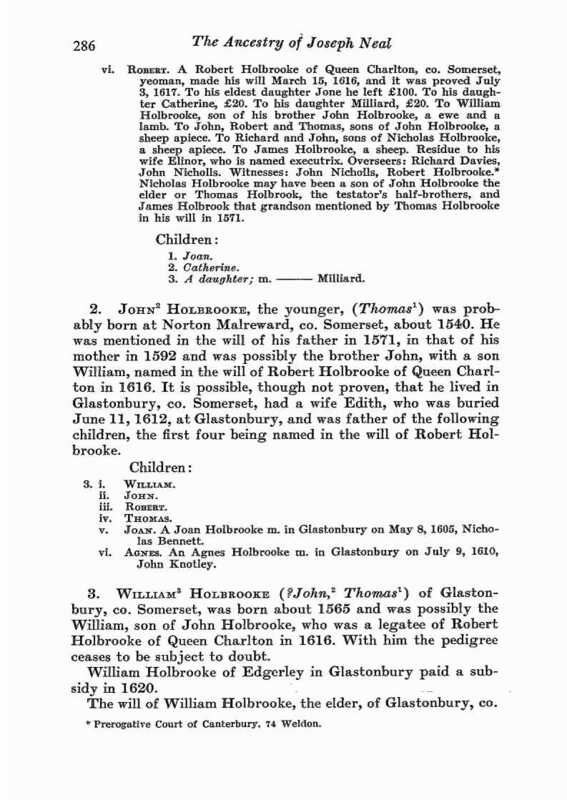 Executors, his sons John Holbrook. Ichabod Holbrook and Ephraim Hunt, Esq., to whom he gave £5. His friends John Rogers and Joseph Dyer and his brother Stephen Fench, overseers; proved 14 Dec. 1699.
i. John Holbrook d. 3 May 1731 Scituate, Mass; m. ca. 1670 to Abigail Pierce. ii. Sarah Holbrook m. Simon Whitmarsh. She d. before 1699. Her children were Simon; Ruth, m. ________ Darby; Mary, m. Edmund Jackson of Abington. iii.. Abiezer Holbrook ,d. 1672 ; prob. unm. ; inventory of his estate, Dec. 17, 1672; his father administrator. iv. Hannah Holbrook , m. Ephraim Pierce, son of Capt. Michael Pierce, who fell at Rehoboth. Children, Azrikam, Ephraim; Rachel, m. _______ Peck. v. Grace Holbrook , m. Joseph Nash, mariner, of Boston. He was of Boston, June, 1687, when he gave a deed of land. He and his wife d. before 1699. They had Joseph, who was of Scituate, Jan. 7, 1698-9, when he sold to John Souther of Boston, part of a dwelling-house in Boston, near North Battery. At that time he had a sister Elizabeth Nash of Weymouth ; and seems to have had a brother John of Boston. [Suff. Deeds,”24 : 47-49.
vi. Samuel Holbrook ,b. perhaps about 1654 ; m1. Mary [__?__]; m2. Lydia [__?__] who married secondly, Deacon Joseph Allen and died in 1745.
vii. Lois Holbrook (twin, b. 12 May 1658 ) prob. d. young. ix. Experience Holbrook b. May 23, 1661 ; m. Joseph Edson, son of Dea. Samuel Edson of Bridgewater. Children, Joseph, Josiah, b. 1682, Experience. Mrs. Edson, d. 1685 [See Mitchell’s History of Bridgewater. x. Ichabod Holbrook b. 20 May 1662 Weymouth, Norfolk, Mass. ; d. 14 Dec 1718 Weymouth, Mass. On 25 Jul 1688 he married Sarah Turner of Weymouth, daughter of John Turner and Ann James of Scituate. They were the parents of six children,all born in Weymouth, Norfolk,MA. William’s first wife Elizabeth Pitts was the daughter of the widow Elizabeth Pitts. Elizabeth’s mother was Elizabeth Pitts. This may be the Elizabeth Pitts who joined the first Church of Charlestown on 13 Apr 1643. Administration on the estate of Elizabeth Pitts who died in Weymouth, MA was granted to William Holbrook and Elizabeth, his wife, on 01 August 1655. Part of the Suffolk probate account reads: “My mother Mrs. Pitts oweth to me for attendance in her sickness of 26 weeks, L10”. Therefore, Elizabeth, the wife of William Holbrook of Weymouth, 1655, was a daughter of Elizabeth Pitts. The daughter may or may not have been born a Pitts. Source: History of Weymouth, MA by the Weymouth Historical Society, 1923. William’s second wife Abigail Wright was the daughter of Richard Wright. and the widow of Robert Sharpe and Thomas Clapp. Abigail died 3 Jul 1699 in Scituate, Mass. William lived in Weymouth until about 1663 when he settled in Mendon only to be driven out during King Philip’s war. The last twenty years of his life were spent in Scituate. William immigrated from England to Weymouth with the family as a teenager. He married Elizabeth and they raised 11 children at Weymouth, MA. He was a Freeman there in 1647. In 1662 10 Wyemouth citizens were given land in Mendon and on 23 May 1662 William Holbrook signed the “regulations” for Menham and was chosen “manager” for that year. On 15 May 1667 Mendon was incorporated by the General Court at Boston, MA and in 1669 Whilliam Holbrook and his family moved there. In 1670 William Holbrook bought 40 acres more in Mendon from Moses Paine. William Holbrook was Selectman in 1672, deacon of the Congregational Church from 1667 on, and Captain in the militia. On 14 July 1675 Mendon was the first town in MA attacked in King Philips War and it was reduced to ashes. William Holbrook and his family fled and they did not return. William Holbrook sold his Mendon land to brother Thomas Holbrook and nephew Peter Holbrook in 1679. William Holbrook was at Scituate, MA by 1676. He purchased lands in Conihasseett, adjoining the farm of Capt. Michael Pierce, on the sowth-west. His house was built on the south side of the Cohasset road, a half mile west of Capt. Pierce’s. William Holbrook’s will was dated 09 September and it was proved 17 July 1699. 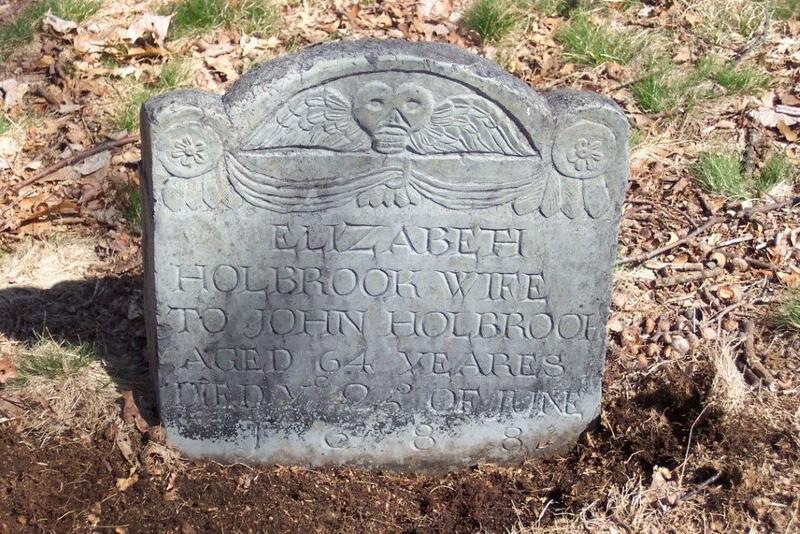 Elizabeth Holbrook – b. about 1649, Weymouth, Norfolk Co., MA. m1. at Hingham, Plymouth Co., MA on Dec. 13, 1666 John Sprauge (bap. Apr. 1638, Charleston, MA; d. Oct. 26, 1683, Mendon, Worcester Co., MA), son of William Sprauge and Millicent Eames.Elizabeth married second after 1683 John Buck. Children of Elizabeth and John Sprauge: John died as infant; Elizabeth married James Walling; John married Mary Killian; William married first Hannah Mitchell, and second Sarah Wharfield; Persis; Ebenezer married first Mary Mann and second Elizabeth; David married; Hannah; and Millicent married Mr. Peck. Samuel Holbrook – b. about 1650, Weymouth, MA; d. Oct. 29, 1712, Scituate, MA. William Holbrook – b. Jun. 23, 1657/8, Weymouth, MA; d. Nov. 19, 1714, Mendon, MA. Settled at Mendon, MA, and “was rich.” Will dated Nov. 15, 1714, and proved Dec. 16, 1714. Married at Sherborn, MA Margaret Fairbanks ( b. Jun. 27, 1664; d. after 1714), daughter of George Fairbanks and Mary Adams. Children (all who died young): Mary; Margaret; and William. Hopestill Holbrook – m. 1688 Samuel Read (d. about 1717), son of John. Children: Samuel married Deborah Chapin (ancestors of Pres. William Howard Taft); John; Josiah; Ebenezer; and Mary. Cornelius Holbrook – b. Nov. 19, 1662, Weymouth, MA; d. Dec. 14, 1742, South Weymouth, MA. Will proved Dec. 24, 1742. m1.about 1686 Margery Eames, daughter of Justus and Mehitable Eames; and second Experience (d. Jan. 19, 1742). Children of Cornelius and Margery: Mehitable m. Mr. Corbet; and Margaret did not marry. 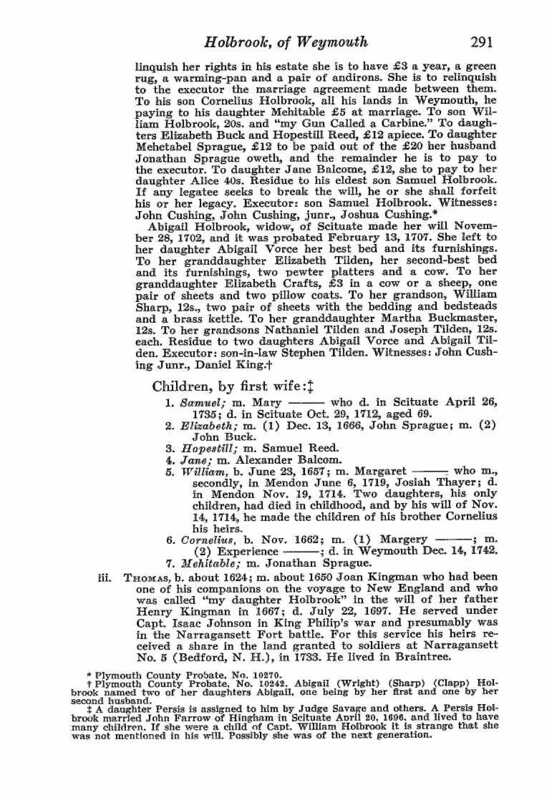 Children of Cornelius and Experience: Experience married Timothy Thayer; Elizabeth m. Samuel Jackson; Abigail married John Jones; Mary married Ebenezer Bicknell; William m1. Margaret Torry, and second Elizabeth Poole; Hannah died young; and Cornelius. Jane Holbrook – d. after 1702. m1. Oct. 18, 1671 at Medfield, MA, John Albee; and second about 1677 Alexander BALCOM (d. May 4, 1711), as his second wife. Children of Alexander and his first wife: Katherine; Alexander; and Sarah. Children of Jane and Alexander: John; Freegift; Joseph; Hannah; Samuel; Deborah; and Lydia.Our ancestor Alexander BALCOM Sr was born about 1630 in Balcombe, Sussex, England. Birth was possibly in Sussex or in Holland as his family is en route to New England. The name of his first WIFE is not known. The first record of Alexander Balcom in New England was in Portsmouth, Rhode Island, where he was the tenant of a house in 1661. There is no record of his immigration. He married Mrs. Jane Holbrook Albee around 1676 in Providence, Rhode Island. Alexander died 4 May 1711 at Smithfield, RI.. His will was dated 31 May 1711 The inventory of his personal estate was 35 pounds, 4 shillings, 7d. Mehitable Holbrook – d. Oct. 29, 1719, Smithfield, Providence Co., RI. m. Jul. 20, 1670 at Weymouth, Norfolk Co., MA to Jonathan Sprague (bap. May 28, 1648, Hingham, Plymouth Co., MA; d. Sep 1741, Smithfield, Providence Co., RI), son of William Sprauge and Millicent Eames. Jonathan was prominent in town and colony affairs. m2. Hannah (Harris) Cook. Children of Mehitable and Jonathan Sprauge : m1. 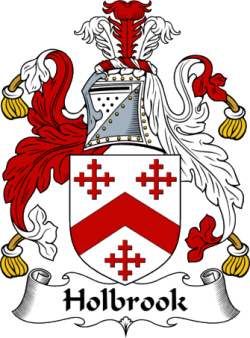 Bethiah Mann, and second Hannah Coggesgall (his son Jonathan Sprauge III married Mary Mowry , daughter of Henry Mowry and Mary Bull); Patience married Judge William Jenckes; Joanna m. John Tefft, Sr.; Persis married Ebenezer Cook; William m1. Alice Brown, and second the widow Mary Walling; and Mary m1. David Brown, and second Judge William Jenckes (widower of her sister). John – b. Mendon, MA; d. 1721. m. Sarah Chittenden. Thomas’ first wife Joanna Kingman was born in 1624 in Frome, Somerset, England. She arrived on the same Hull Company voyage as the Holbrooks when she was 11 years old and Thomas was 10. Her parents were Henry Kingman and Joane Drake. Joanna died in 1696 in Weymouth, Mass. Thomas was born 1624 probably, as parish registers for that year are missing, and was mentioned in Dec. 1628 in his grandfather’s will. Thomas served under Capt. Isaac Johnson in King Philip’s war and presumably was at the Narragansett Fort battle. See my article Great Swamp Fight. For this service his heirs received a share in the land granted to soldiers at Narragannsett No. 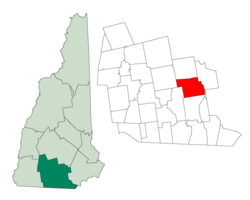 5 (Bedford, NH) in 1733. He lived in Braintree. S.P.11-326 – Will of Thomas Holbrook of Braintree, Jul.25,1695 – Aug.19,1697, mentions wife Jane, sons Thomas & Peter, daus. Mary Coleborne, Susanna Willett, son in law Uriah Clark. To wife Jane 1/2 income of all lands & moveables in Braintrey during widowhood, & use of all my now dwelling house & barns & £20 more for use if need be. To son Thomas all lands & meadow in Braintree 1/2 at my decease 1/2 at wifes decease for his own use & not to pay debts etc. & at his decease to his heirs & if he dies without issue to the male heirs of the Holbrook’s next of kin. To son Peter all estate in Mendon formerly purchased of my brother William Holbrooke together with my part of a sawmill at Mendon, which are already in his possession, also 10 a. in Braintrey now fenced & bounded, formerly purchased of Solomon Curtis or in lieu of sd. 10 a. £40 money which I leave to the choice of my executor & £10 more. To dau. Mary Coleborne as addition £20. To dau. Susanna Willett £35. To son in law Uriah Clarke 10 shillings. Wife Jane & eldest son Thomas executors. Friends Nath’l Wales of Braintree & cousin Samuel Holbrooke of Weymouth overseers. Witness: Joseph Arnold, John Hooper, Jos. Allen. Memo: Mar.26,1696 – If son Thomas die before his wife she is to have 1/3 part of increase of said lands while a widow. Joseph Allen to be overseer as Samuel Holbrook being deceased. Witness: Samuel Allen, Joseph Allen. Inventory, Jul.23,1697: Housing & land in Braintree £600, Personal £87/16/. Elizabeth’s husband Walter Hatch was born in 1623 in Tenterden, Kent, England. . His parents were Elder William Hatch (1598-6 Nov 1651) and Jane Younge (31 Dec 1593-8 Oct 1653), Walter died on 24 May 1699 in Scituate, MA. He was killed by lightning in a stable. Occupation: shipwright. Walter bore arms 1643. He settled on a point of land northeast of Stoney cove, and southeast of the second Society’s Meetinghouse. He built the corn and fulling mills in the Two Mile (for his sons). Walter made one will in 1681/82 which was never proved; for after his will was made his son, Antipas, became of unsound mind, and Walter made a new will 3 Mar 1682, providing for the maintenance of Antipas, but leaving to his brothers the land formerly intended for him. Will abstract: [1: 335-338: OS Docket #9,609 contains the will and inventory.] The will of Walter Hatch, late of Scituate, provided for his wife, Mary and made bequests to his sons, Samuel (eldest), John (executor), Israel (executor), Antipas (to be cared for by John and Israel), and Joseph (youngest): daughters, Jane Sherman, and Bethyah Ford. He also made a bequest to “all my grandchildren that are born before my death.” Wit: Thomas Ouldham, Joseph Lapham and Samuel Lapham (each of whom signed by a mark). iii. Jane Hatch b. 7 Mar 1656, d. 29 Sep 1744; m. John Sherman on 25 Oct 1677 at Boston, Mass. v. Bethia Hatch b. 31 Mar 1661 Scituate, Mass. ; d. 22 Nov 1728 Marshfield, Mass; m. Michael Ford on 29 March 1683 at Marshfield, Plymouth County, Mass. vii. Israel Hatch b. 25 Mar 1667 Scituate, Mass; d. 11 Oct 1740 Marshfield, Mass; m. Elizabeth Hatch on 27 July 1699 at Scituate, Plymouth County, Massachusetts; Israel and Elizabeth were second cousins; his paternal grandfather, William Hatch, and her paternal grandfather, Thomas Hatch, were brothers. 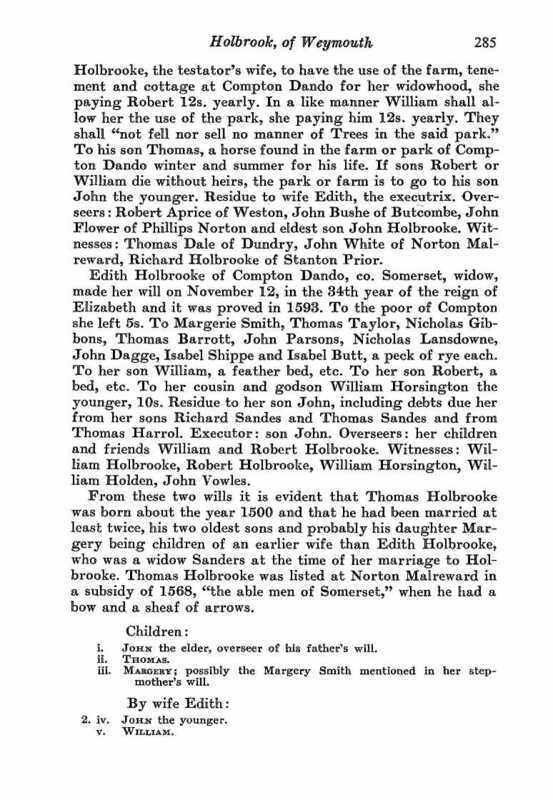 Jane’s husband Thomas Drake was born 13 Sep 1635 in Colyton, Devon, England. His parents were William Drake and Margaret Westover. He first appears at Weymouth, 14 Dec. 1663. On that day the town granted him six acres in the First Division and eighteen acres in the Second Division. (Weymouth Land Grants, 283.) After Jane died, he married again at Marshfield, 9 Mar 1681 to Millicent (Ford) Carver, widow of John Carver of Duxbury, and daughter of William Ford, who came to Plymouth in the Fortune in 1621. Elizabeth Drake, who married in Boston, 8 Jun 1654 to Ezekiel Hamlin, and Joane, the wife of Thomas Randall of Weymouth, were his sisters. 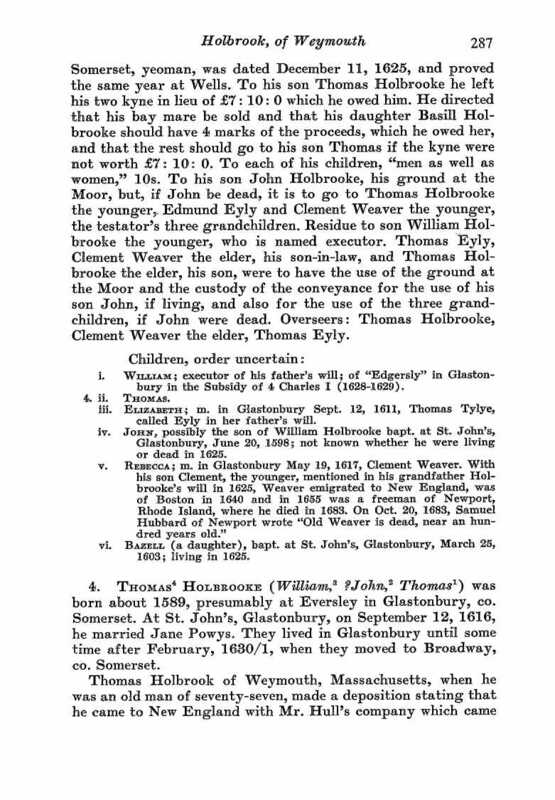 Thomas died Weymouth MA 23 Sep 1692, estate settled in 1692. This entry was posted in 12th Generation, Immigrant - England, Line - Miner, Pioneer, Public Office and tagged Great Swamp Fight, The Hull Company, Weymouth Pioneer. Bookmark the permalink. Just want to say thank you for your good research here. I believe I read somewhere (!) that Neal is a reliable resource. Thomas Hobrook is my 9th great grandfather so I believe we are cousins.